Francis Smylie/Smiley 1689 → Hugh Smiley 1723 → William Smiley 1757 → Hugh Smiley 1785 → Shepherd Parkman Smiley 1828 → Thomas Alexander Ward Smiley 1867 → Shepherd Thomas Smiley 1900-1992. 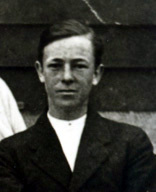 Shepherd Thomas Smiley was the fifth of the eleven children of Thomas Alexander Ward and Marion Harley (Bunn) Smiley. As Shep's parents shifted the family often to cater for his father's work as a mining contractor, his childhood saw him living in a variety of locations in Melbourne, country Victoria and Kapunda, South Australia. Like the rest of the family, Shep went to Brighton Road State School and then, by means of scholarships, to Essendon Grammar (travelling by steam train) and to Wesley College. He helped out at his father's butcher's shop at 338 Inkerman Road, St Kilda, before getting a position in the Victorian Railways where he worked in the section handling the supply of materials for the building of the railway across the Nullabor Plain to link Western Australia with the eastern States. On 20 October 1918, a week after his 18th birthday, he joined the Army to "help win the First World War" but did not get as far as his first assignment at Dookie as the war finished on November 11 that year. With the war over, he returned briefly to the Victorian Railways. 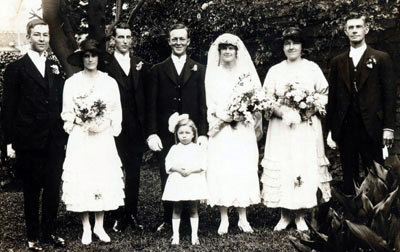 On 20 November 1920, at Balaclava Methodist Church, Shep married Lillian Havergal Powell, daughter of painter Thomas and Sarah (Simeon) Powell. Both were aged 20 at the time of the marriage [click on photo to see a larger image]. They set up home at Glen Waverley where Shep had an orchard. Shep used to tell his family the story that he could sleep on the way back from selling produce at the Victoria Market because the horse knew the way home up High Street Road and out to Springvale Road. At this time Shep acted as organist for the Wheeler's Hill Church for six months. Also about this time, his father Thomas became ill and sold the St Kilda shop. It was decided that Shep and his father would start a butcher's shop together hence a move to Gardiner (see later reference), with Thomas financing the start of a business which lasted through three generations. They started in Gardiner in a shop on the corner of King Street and Burke Road, but as they could get only a six months lease, they purchased land at the top of the hill and built their own shop and the one below it, which they rented out. Shep's son Bruce worked there before and after his World War Two service, and ended running it as his own business. All told, the business was in the family for 50 years. Shep and Lillian moved into 24 Parkin Street, Glen Iris, in 1928, and it remained the family residence until after Lillian's death in 1985. They had five children - Joy, Bruce, Norma, Ian and Rosemary - a family very involved with the Gardiner Congregational Church. For many years Shep was church secretary and Sunday School superintendent, as well as a valued player in the tennis club and in the Congregational Tennis Association. He was also an accomplished gymnast and worked well on the parallel bars. Shep was very community minded, serving for some time as chairman of Gardiner School Committee. A good bowler, he also served as president of Gardiner Bowling Club and was a founding member of the South Camberwell Tennis Club. Lillian also enjoyed bowls and took her turn as president of the Gardiner Ladies Bowling Club. Shep's aptitude for figures came to the fore as treasurer of the Meat and Allied Trades Federation, of which he was a founding member and later president. On his retirement, Shep joined Coatesville Bowling Club and in 1982 he married Dorothy Jean Fowler (known as Jean), who was born at Ascot Vale on 21 November 1916, daughter of Albert Henry and Jessie Rebecca (Ray) Fowler. Shep and Jean traveled widely and enjoyed many happy times together, one of which was Shep's 90th birthday at Cumberland View Retirement Village with his family and friends. Shep died in Melbourne on 13 December 1992, aged 92. Lillian died at Kew on 7 May 1987, aged 86. Shep's second wife, Jean, died in Melbourne on 20 February 2009, aged 92.